Operation Juniper Cobra is not a routine exercise; it is a portent of a potentially devastating war against Syria, Hezbollah and Gaza for which Israel is actively preparing — a war likely to erupt within the coming months. Previous reports on the operation suggested that, like prior incarnations of the same exercise, the focus would be on improving Israeli defenses. “Juniper Cobra 2018 is another step in improving the readiness of the IDF [Israeli Defense Forces] and the IAF [Israeli Air Force] in particular to enhance their operational capabilities in facing the threat posed by high-trajectory missiles,” Brig. Gen. Zvika Haimovitch, the IDF’s Aerial Defense Division head, told the Jerusalem Post. However, this year’s “Juniper Cobra” is unique for several reasons. The Post reported on Thursday that the drill, set to end on March 15, was not only the largest joint U.S.-Israeli air defense exercise to ever happen but it was also simulating a battle “on three fronts.” In other words, Israel and the U.S. are jointly simulating a war with Lebanon, Syria, and Palestine – namely, the Gaza strip – simultaneously. As MintPress recently reported, Israeli officials recently told a bipartisan pair of U.S. Senators that it needed “ammunition, ammunition, ammunition” for a war against Hezbollah in Lebanon — a war that will expressly target Lebanese civilians and civilian infrastructure, such as hospitals, schools, and apartment buildings. The alleged motive for the invasion is the presence of Iranian rocket factories. However, this allegation is based solely on the claims of an anonymous deputy serving in the Iranian Revolutionary Guard and was first reported on by a Kuwaiti newspaper known to publish stories planted by the Israeli government. Such a war is likely to be ignited by the unrest destined to follow the U.S.’ imminent move of its embassy from Tel Aviv to Jerusalem. The move, set to take place in May, led Hamas to call for a third intifada, or uprising, in response to the U.S.’ unilateral decision to recognize Jerusalem as the capital of Israel in defiance of the international consensus. “We are ready to commit to the defense of Israel and anytime we get involved in a kinetic fight there is always the risk that there will be casualties. But we accept that, as in every conflict we train for and enter, there is always that possibility,” Clark told the Post. Operation Juniper Cobra is not a routine exercise; it is a portent of a potentially devastating war for which Israel is actively preparing, a war likely to erupt within the coming months. 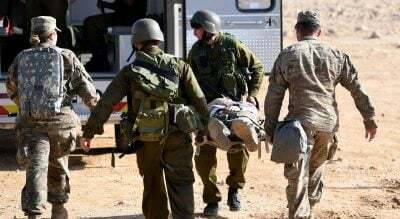 In addition to overtly targeting civilians, these preparations for war — as Juniper Cobra shows — directly involve the United States military and give the war-bent Israeli government the power to decide whether or not American troops will be involved and to what extent. This is a devastating giveaway of national sovereignty by U.S. President Donald Trump. While the potential involvement of the U.S. forces in such a war is being framed as limited in scope, there is no indication that such a war will be so in practice. Indeed, the U.S. is currently occupying 25 percent of Syria and the Trump administration has economically attacked Palestinians living in Gaza by withdrawing crucial aid, as well as Hezbollah by enforcing new sanctions against the group. Furthermore, Israel’s nuclear arsenal and the fact that Iran — and even Russia — could become involved in such a conflict means that it could quickly spiral out of control.